15 Fun Activities For Kids That Are Cheap! One of the absolute best frugal ways to have fun with your kids is to pick up an “end roll” of paper from the offices of your local newspaper. When a newspaper is printed, the paper that it’s printed on comes in a large spool – imagine your toilet paper roll, except the size of a newspaper and much, much larger. The paper rolls off, is printed on and cut, and is folded to make the newspaper that you read. At the end of a newspaper print run, quite often some of the spools will have a small percentage of the paper still on the roll, unused. Because it’s more expensive to have to stop the press and change the roll mid-printing, the people running the press will just remove that mostly-used roll (still with hundreds of square feet of paper on it) and replace it with a full roll, so that the next time the press fires up (for the next day’s paper), they won’t have to stop it early on to replace the roll. So what do they do with those leftover rolls? They hand them over to their front office, which sells them to the public for just a dollar or two. Seriously – stop by the office of your local newspaper and ask about end rolls. Most newspapers sell them, and what you’ll receive is a large roll of blank newspaper for just a dollar or two. And that, my friends, is one of the best bargains around for entertaining your children. Hundreds of square feet of biodegradable newspaper is an incredible resource for letting your family’s imagination run wild. Here are fifteen great ways to transform that $1 end roll of newspaper into a creative and fun activity for kids and the entire family. Even if you don’t have kids, read through these – you might find some useful and inexpensive ideas of your own, like making a pinata for the child of a friend or helping out big time with gardening. This is the “obvious” thing that most people buy end rolls of paper for. You can cover the entire kitchen table or coffee table with the paper and let everyone’s imagination run wild. Not only does newspaper allow for an enormous canvas, a roll of newspaper allows for many such canvases. A big pile of paper? Some scissors? Several paperclips and maybe a penny or two? You have everything you need to build some awesome paper airplanes. Not only can this be a lot of fun, it can teach you a lot about engineering and physics. How does the plane balance itself? What’s the best kind of plane you can build? 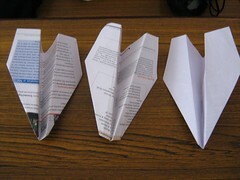 Here are some great blueprints for dozens of paper airplanes – I particularly like “the dragon”. You can also color and design the planes if you’d like – I made one when I was young that looked kind of like the Red Baron. This is a great idea, particularly if you have a parent with some artistic skill. Just draw a simple person on the paper with good dimensions, then let the children color the clothing and the person. If you don’t have artistic talent, you can always go find some simple patterns to download and trace them. If you want, cut them out and play with them. My grandmother used to do these drawings all the time for my niece – she could just sit down with a pencil and draw unbelievable fashion models freehand in just a minute or two, which made for great paper dolls. With so much paper, you’ve got a perfect opportunity to learn the basics of sculpting and to make some interesting items (like a pinata). All you need is the newspaper cut in strips, a good-sized balloon, some paste, and some paint to paint up the finished product. Just coat the strips in paper mache paste, put them around the inflated balloon leaving one end just open enough so that you can put goodies inside, allow the sculpture to dry for a few days, then pop the balloon and put goodies inside. Then, put paper mache over the opening and allow that to dry. Paint it up and you’ve got yourself a homemade pinata. You can also sculpt other things with paper mache with some creativity – try a Viking helmet, for example. This was something I did in school in second grade, actually. We took large pieces of newspaper, folded them in half, and cut out a neck hole along the fold to make a poncho, as depicted here. Then, everyone can get involved in decorating the ponchos in interesting designs. I remember making mine look like a giant Canadian flag (even though I’m not Canadian – I was a quirky second grader). There are lots of little, simple pencil-and-paper games that two (or more) players can play – tic-tac-toe is just the start. Hangman, dots-and-squares, and sprouts were among my favorites as a child – and I still play them on occasion. These are excellent little ways to get your brains thinking. Big sheets of newspaper beg for some neat paper hats. Once they’re done, you can decorate them however you wish – paint it all black and put a skull and crossbones on it to make your child a pirate, for instance, or make it purple with yellow stars and moons. For me, at least, a big sheet of paper is an excuse to write. I’ll just start writing something if I see a big sheet of blank paper, and it’s a great thing to encourage your kids to do as well. One good idea if you have three to six kids is to spread out a big sheet of paper on a table, and then have each of them start writing a story. Then, every two minutes, have them rotate to the left one spot and continue the story. After several rotations, stop it and then read all of the stories out loud – they’re usually quite entertaining. I actually got really into this with a childhood friend – we had a notebook that we wrote this long, elaborate story in. I would write one page, then pass it to him. He’d write the next page, and pass it back. Incredible fun for a very long time. If you’re making all this interesting stuff, why not use some of it for room decoration? Spread out the paper and make drawings and other items specifically to decorate their room. Cut out colored shapes, make interesting pictures, and anything else you can think of. Collages made out of magazines can be great – in fact, I’ve started saving some magazines in a tub down in the utility room just for this future purpose (so they have tons of magazines to harvest from). 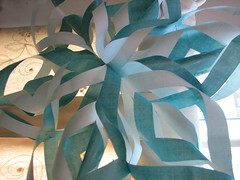 There are so many interesting designs and items you can make through paper folding (and a bit of cutting). I actually get into this quite a bit around Christmastime, as I love making three-dimensional colorful paper snowflakes that really look gorgeous. You can make much simpler paper snowflakes as well, and designs for any other holiday, as well as paper flapping birds, paper frogs that hop when you tap them on the back, and so on. If you have a group of your child’s friends over, make some friendship posters that each child can keep as a memento. Roll out a big piece of paper and have all the children work together for a while (ten to fifteen minutes) on a poster, then repeat so that each child has one to take home. Let the child whose poster it is pick some of the main colors. It’s a great (and cheap) way to create a memento. Going out on the water somewhere? Have your child make their own paper boat out of newspaper and let them set sail with it. Since newspaper biodegrades very quickly, it’s not disastrous if you lose the boat, plus it’s a lot of fun on water. If you want the boat to last longer, rub some wax (just use a candle) on the bottom of the boat to increase water resistance. Like to garden? You can easily make small paper seedling pots out of newspaper, so that you can just fill each pot with a bit of soil and a seed. Then, you can just go plant the entire seedling pot when the garden is ready and spring has arrived – since the paper will biodegrade, you can just drop the whole seedling pot in the ground. I know many gardeners who do this out of hand anyway, as it’s cheaper than most ways to start seedlings. Plus, you can use the newspaper (with some straw) to cover much of your garden, keeping the weeds under control while still being completely natural. On the most basic level, you could simply use this end roll paper for wrapping gifts, then allow your children to decorate it. But you could easily go even further than that, using the newspaper to make your own paper – and then use that paper for greeting cards or handmade journals. These can be awesome gifts for anyone to make for someone else. Roll out a piece longer than your child on the floor, then have your child lay down and trace their outline. This can provide a brilliant canvas upon which to draw, as your child may want to make a self-portrait. You might also get a kick out of making one of these every year and “stacking” them by gluing last year’s silhouette to the front, creating a progressive view of your child’s growth for a wall hanging. Awesome! How can I get started? All you need to do to get started on these projects is call your local newspaper’s front office and ask if they sell end rolls of paper. Most newspapers sell small rolls for $1 and bigger rolls for $2 or $3 – and they’re happy to get rid of them. Once you have the roll, take it home and keep it in a closet – and break it out on a rainy day (or any day) for a lot of fun. A final tip: the tube in the middle can itself be a very fun toy.